we offer a brief Daily Prayer. read this Guide to Daily Prayer. who is Christ and Lord. While so many of our cultures only celebrate the build-up to Christmas, as a faith community we celebrate Christmas for the next several weeks. And, there is much to celebrate here, much to enter into more deeply. Too often, the days before Christmas are too busy to enter into the meaning of this feast or to reflect on the daily scriptures and the graces that are offered us, in our concrete life circumstances. This first week is a time for us to enter into the stories of special saints who are associated with the Birth of our Lord because of their innocence: our first martyr and the Disciple Jesus loved. Next week, we return to stories of Jesus' life and ministry. December 26, the day after Christmas, is the Feast of St. Stephen, the first Martyr. The reading from Acts takes us into the story of his being stoned by an infuriated crowd. December 27: On December 27th, we traditionally celebrate the Feast of St. John, Apostle and Evangelist. This apostle's name is associated with the wonderful tradition and writings that receive his name. This week, our reflection is framed by the wonderful words of the First Letter of John and the story from the Fourth Gospel of Simon Peter and “the other disciple whom Jesus loved” ran to find the empty tomb on Easter morning.Feast of St. John the Evangelist. On December 28th, we celebrate the Feast of the Holy Innocents. This celebration takes us back into the infancy narrative of Matthew. The account of how Jesus begins his journey to become one with us, is powerfully told as a journey of Jesus' entering into the journey of his people, with the flight into Egypt and the horrible slaughter of the innocent children. This very difficult scene is important for us to reflect upon as we imagine the unborn and the newly born who are so unjustly deprived of dignity and life today. On December 29th, we enter into the story of the Presentation in the Temple, and where we meet Anna, the prophetess. She is the last of our prophets that seem to step into the pages of the New Testament. Their faithfulness and hopeful expectation are signs for us of who this child will become for us. 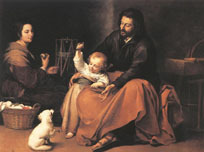 The Feast of the Holy Family is often celebrated on the Sunday after Christmas. When a Sunday does not occur between December 25 and January 1, this feast is celebrated on December 30 with only one reading before the Gospel. 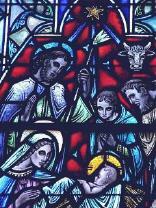 What family or faith community can't benefit from reflecting upon the Holy Family? This is not the time to reflect upon a "perfect family," but to ask ourselves how we might be blessed to reflect upon Joseph, Mary and Jesus, and ask ourselves what graces they could offer us. 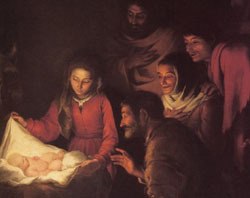 And, this allows us a bit more time to reflect upon the Christmas story, including the everyday reality that was part of their lives as family - the patience, give and take, the self-sacrifice and the love that was a part of their very human interaction together, throughout what we call "the hidden life" of Jesus. That can include all the growing up years of Jesus' life, what their village was like and what ways they spoke with each other, as well as what difficulties they might have experienced. These are all great ways for us to contemplate this feast. We can imagine what Jesus learned from both Mary and Joseph that prepared him for his life of proclaiming the comingof the Reign of God. Finally, we can imagine the death of Joseph and the life of Mary and Jesus after his death. Sunday, January 1st will be the Solemnity of Mary the Mother of God. It is also the World Day of Prayer for Peace. We celebrate the Epiphany, in a week or so. We can draw great fruit from reflecting upon the readings and prayers of the days before Epiphany or the days after Epiphany. This week we keep asking for the grace to celebrate his coming among us. Each of us can keep growing in a sense of freedom and joy over the gift we have been given to know God's love for us and presence with us more deeply. It is a week of gratitude. However, if our celebration of the days before Christmas and Christmas Day itself were busy or even difficult, then this can be days of recovery and added time to let Our Lord come into our lives where we need him to come. Make use of the other resources we offer here, on the left side of this page, or on the site index. Let the heavens be glad and the earth rejoice!